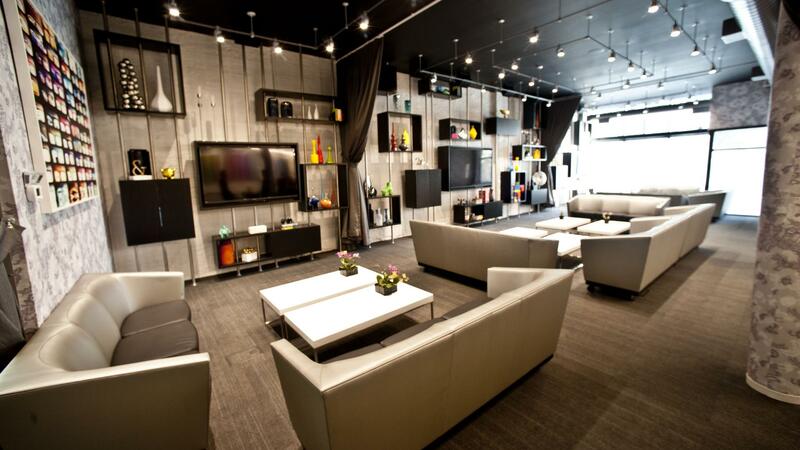 Rent OFFSITE Chicago | Corporate Events | Wedding Locations, Event Spaces and Party Venues. Located in Chicago's West Loop, OFFSITE Chicago offers companies a turnkey multi purpose facility designed and wired to inspire creativity, innovation and productivity in a way never before possible. Ideal backdrop for your next board meeting, product launch or wedding. The venue boasts chic modern décor, a state-of-the-art A/V system, and an extensive list of amenities to provide the ideal backdrop for your next board meeting, brainstorming session, focus group, product launch or social event. OFFSITE’s versatile furniture can be quickly rearranged to make room for a fully catered, private social event or holiday party for up to 100 guests. We simply flip up and remove our conference room tables, and—justlikethat—OFFSITE turns into the perfect, sophisticated event space you’ve been waiting for! Allow your guests to dance across our three levels, have a drink from our bar and enjoy hors d’oeuvres from your chosen caterer. Our stunning shimmer wall and chic architectural and design touches are sure to make a lasting impression. Transformative floor plans accommodate from 15-100 seated in the Main Room; ideal for presentation or classroom style seating for training sessions, focus groups or team building exercises. A modular, removable 26-person conference table and magnetic, glass writing panels on the wall make for a state-of-the-art boardroom on the Mezzanine level. Custom-designed 50-foot display wall for showcasing products and branded materials. Fully stocked kitchenettes with delicious snacks, coffee, tea and cold beverages on each floor. On-call host to take requests such as booking a car-service, printing documents, and even fulfilling VIP riders. Staff to handle check-in and reception, assist with audio/visual, food and beverage and maintain the cleanliness and efficacy of the space throughout every meeting. Office supplies to get the job done, so you can jump right in and put pen to paper—or marker to whiteboard wall for that matter. Always a little something extra – fresh flowers, creative decor, stimulating trinkets and inspiring reading material throughout the space. We only offer Partial Buyouts based on the capacities listed for each room. Rates start at $1,500 per day and go up, depending on event timing and guest count. ** there are no additional service charges, gratuities or other hidden fees here at OFFSITE.